Mary's Wonder Women: Where are the female AFLW coaches? Has that purpose been achieved and if not, are we on track to achieve it? Season one, I was blown away by the joy which surrounded the competition. It dominated the news and names like Erin Phillips, Daisy Pearce, Amanda Farrugia and Moana Hope became part of the national conversation. 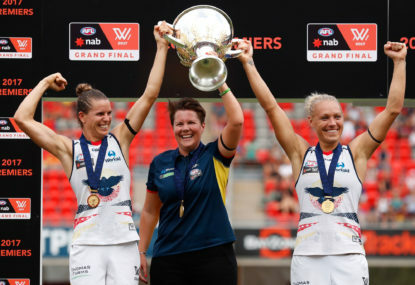 There was momentum surrounding and I was hopeful that this would carry on into season two, particularly after the scenes on AFLW grand final day when Bec Goddard and her team – split across Adelaide and the Northern Territory – held up the trophy for the first time. 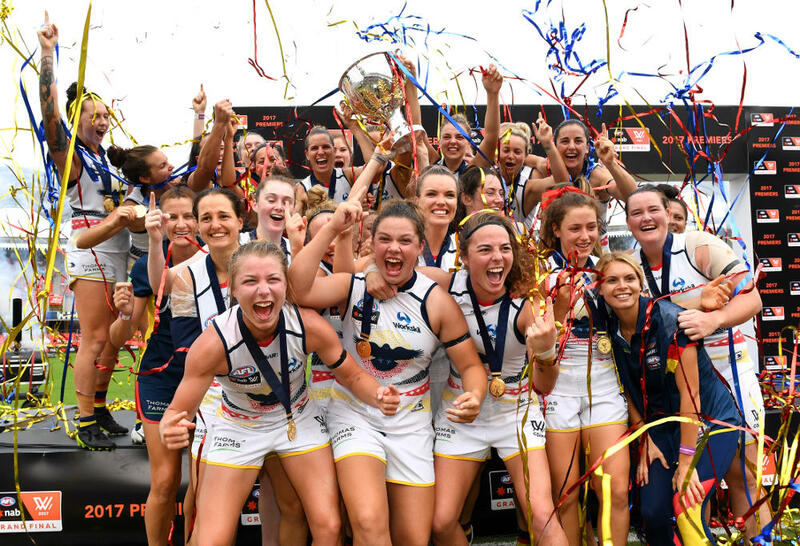 For the most part, the momentum continued – because AFLW helped so many women to fall in love with the game again, while others were brought to the game for the first time. As a female fan of any male-dominated sport, it’s often hard to explain why you love the game so much – particularly amidst allegations of player misbehaviour, sexism and a perceived lack of opportunity for women. But in season two, a couple of other things happened which made me question the direction of the competition and how committed the AFLW really was to making systemic change. The first was the memo leaked, after Round 1, asking coaches to rethink their strategy to produce higher scoring games. The two key areas highlighted were congestion around stoppages and defensive flooding. Asking coaches to prepare their teams in a certain way was disingenuous, did not allow the game to develop naturally at its own pace, and suggested that the AFL did not think that the competition was entertaining enough to maintain spectator interest. Interestingly, I saw no such memo sent to coaches in the wake of some low-scoring games in the AFL this year – most notably the Round 1 fixture between the Gold Coast Suns 7.13.55 and North Melbourne 5.9.39, or the Round 6 clash between the Greater Western Sydney Giants 10.17.77 and Brisbane Lions 5.13.43. But far more concerning was Crows coach Bec Goddard and Fremantle Dockers coach Michelle Cowan both resigning after the season’s conclusion. This means there are no female coaches in AFLW, which is a telling example of women not being supported to take on professional opportunities in what is still a male-dominated sport. How astonishing that there is no longer a place for the coach that won a premiership in her first year, and the club’s first premiership coach in 20 years. Goddard may have been willing to take a pay cut to take a more full-time position, but this was not an option. What separates Goddard and Cowan is that all the other coaches have roles that allow them to support themselves. For example, Wayne Siekman (Collingwood) is a Next Generation Academy coach at Collingwood. Alan McConnell (GWS) is also the men’s director of coaching. Unfortunately, particularly in the case of Goddard, her role was solely as AFLW coach and Adelaide conceded that they could not find the funds or another position for Goddard so that she could continue to commit to coaching. A well-established path exists for men interested in coaching: play football at a professional level, then move into coaching, starting at the bottom and working their way up. Such a pathway does not yet exist for women and nor will it until women in these roles are appropriately supported. We now have a competition which is coached entirely by men, and seemingly judged by people other than the women playing suggesting changes to the spectacle to make it more attractive. This leaves a sour taste in my mouth about the role AFLW has in the wider AFL family and the direction it’s being taken. The NRL starts its women’s competition later this year with four teams – the Brisbane Broncos, New Zealand Warriors, St George Illawarra Dragons and Sydney Roosters. My great hope is that women’s competitions do not look at other women’s competitions as competitors. Each sport can learn from the successes and the failures of the others, and we can get better together. I urge the NRL to closely look at the AFLW and think about what has worked and what has not. I have every confidence the rules will remain the same. I’ve watched plenty of women’s rugby league and I am sure that the product will be exciting, entertaining and compelling. There will be no need for a memo from above to coaches, telling them how to run plays because of concerns about the ‘low scoring nature’ of the game. The slogan of the competition is ‘same game, our way’. I’m hoping that particular emphasis is placed on the ‘same game’ part of that phrase. But the advice I would give to the NRL would be to not create a competition which limits the ability of women to get involved in ways other than playing. Already, the Warriors have announced former Kiwi Ferns captain Luisa Avaiki as coach for the inaugural season. This is a good start. The Women’s National Rugby League competition must make sure that women are given not only the opportunity to play, but to participate in other ways as well.